Passengers wait for their train near a damaged train carriage after a bomb exploded at Ramsis railway station in downtown Cairo November 20, 2014. A bomb went off near a train station in southern Egypt Saturday night, as police found three other explosive devices planted on railway tracks in the region, the government said. A charred body was found near the railway station in Wasta, a town in the province of Beni Suef, the interior ministry said, adding it probably belonged to the person who had planted the bomb. Security forces later combed the region and found three other explosive devices on railway lines linking Cairo to the far southern city of Aswan, the ministry said in a statement. Egypt has been hit by a wave of bombings and shootings since the military ousted Islamist president Mohamed Morsi in July 2013. Assailants have stepped up attacks targeting public transport, including a bomb last week on a train north of Cairo that killed two policemen and two passengers. 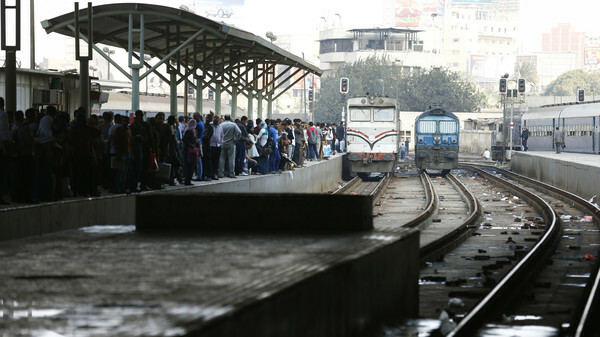 On Thursday four people were hurt in a stampede at the capital’s Ramses station after a blast inside a compartment of a train that pulled in from the Nile Delta, security officials said. The blast was caused by a sound bomb, they said.